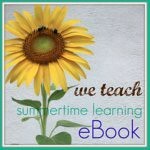 Hot off the presses is the new Summertime Learning ebook. 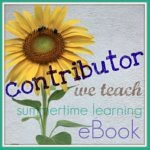 This is a great free resource of Summertime learning that was compiled by members of the we teach forum. I had an opportunity to submit one of my own ideas to this book! This fab resource is free to all members of we teach. If you're not already a member, it's free to sign up... and it's easy. You can also log in with your facebook or twitter account. Head on over here to start your summer of fun learning!